When I exit my 18th arrondissement apartment, I can walk three minutes in any direction and find: a fish market, an artisan butcher, a bakery whose line snakes out the door on Sundays, a wine cave, a tantalizing cheese monger, an exclusively frozen prepared-foods supermarket (! ), various fruit and vegetable stands and my choice of a few big-brand traditional supermarkets. When I first was surprised by the lack of fresh options at the supermarket, I asked my host mom where to find the best fruit. She practically scoffed as she responded that “No, I would never go to Marche Franprix (the big-brand supermarket).” Instead she directed me towards the fruit stand directly across from the apartment, citing their excellent, but expensive fruit. The movement towards local food currently in the United States takes on a completely different meaning in France – the French skip big-brand supermarkets for the most part, and instead frequent specialized locally run stores to obtain the best product. An important part of each community and neighborhood, the venders who run these small stores are depended on to provide expertise in their field of food. Food shopping is a multi-stop excursion, rather than a single trip. The unfortunate part of this, for me, is that there are infinitely more people I need to speak to, in French, while trying to forage supplies for dinner. 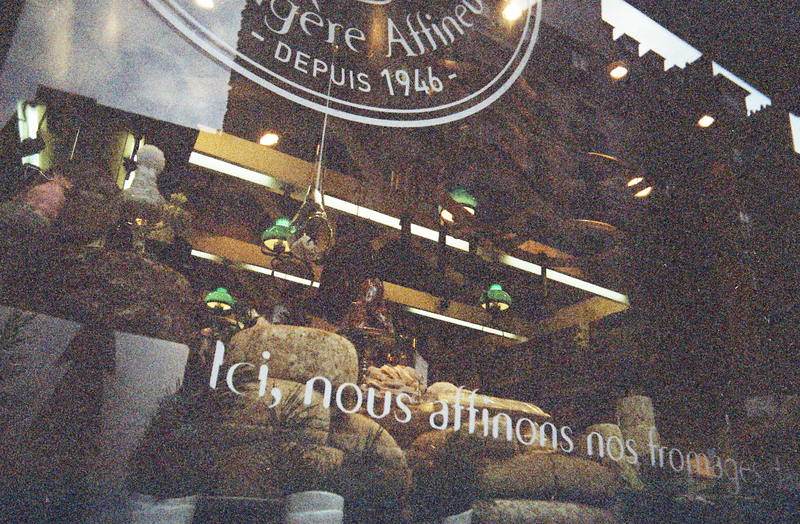 The fromagerie (cheese store) was the first place I dared to enter. Despite my fear of being laughed at, I couldn’t stay away from the tempting mounds of yellowed cheeses stacked upon each other in the window. I left the fromagerie triumphantly, with my block of compte in its delicate white wrapping, and cradled it all the way home. On my second trip to the fromagerie, I inquired about whether or not they took credit cards – and was met with a concrete “Yes, but only above 15 dollars.” On to the butcher I went. It being my first trip, I stared dumbfounded at all the different cuts of meats without any labels, but thankfully I knew the word for chicken breast. As I repeated the same question I asked the fromager, I was met with a quizzically cocked head. Slower, I repeated, “Prenez-vous des cartes de credit?” The butcher waved over one of his comrades, who gazed confusedly at me as I stated the same question, this time holding up my credit card. As he gazed confusedly at me, I finally reverted to English, and stated even louder “Credit cards?” And the butcher vigorously nodded, increasing the volume as well, surely responded, “MUTTON CHOPS?” In horror, I made a frantic motion with my hands, while saying “Non, non!” Finally, the lady next to me repeated the exact question I had originally asked, and they burst into laughter – “Oh! Oh! No I can’t sell you credit cards,” they shouted while bursting into boisterous laughter. “Yes, we take credit cards for purchases over 15 dollars, they cried, while still laughing. As I mumbled a “merci,” I heard their laughter linger on my way home. It took me two whole weeks to go back, but with a wad full of cash, it went off without a hitch.